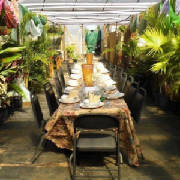 Seasons in the Sun will be adding events, classes and dinners frequently. Check back often and be sure to call to reserve a spot if you are interested in attending. Click on the links below to see more information about the individual events. Make sure to sign up for events ASAP as space is limited. Fill out the Online Events Registration Form to sign up. If any event is not at least 75% full, we reserve the right to cancel the event. Should an event be cancelled, you will be notified by the email address on your event registration at least 24 hours prior to the event. We will do our best to reschedule. If you need to cancel your event resevation, we require at least a 2 week notice in order to offer a refund. Refunds can not be made for cancellations made less than 2 weeks before events or no shows. We do this so that we can offer your spot in the event to someone else. Lunch served here on the farm from fruits and veggies we grow and meats we raise (or get from other local farmers). Its your chance to get out of the office, or just away for a little while and be at peace with nature. Listen to the ducks quack and the chickens cluck. Watch farm life while enjoying a wonderful lunch made from all things fresh...all things natural ...and all things grown right here. This Dinner is like the Farm To Table Dinner, however only winee will be served with the meal and the meal will be a little shorter in leangth but we will still have a 6 course meal. Assorted fresh baked breads with homemade assorted butters and dipping oils and sauces. Followed by a salad made fresh from our hydroponics and topped with my homemade poppyseed dressing. After the salad will be a freshly prepared soup followed by an appitizer. Dinner follows with dessert ending the meal and the evening. Upon arrival will be a breif farm and greenhouse tour with refreshments served before the tour begins. This dinner is less expensive than the Farm To Table, but you are still dining on the farm and will all freshly prepared foods from the farm. The experience is just as wonderful. Please plan to attend or reserve seats at the table for a gift for someone. Upon arrival you will be greeted and served a Farm Punch. Finger foods will also be served while you tour our farm. After your guided tour you will be seated at the table and dinner will began with assorted breads and homemade butters and infused oils for dipping. This is be followed with homemade chicken noodle soup. This isn't like any you have ever had before. We make ours with all homegrown items including the chicken. Next you will be served a salad made with 3 different hydroponically grown lettuces and other greens (let's see who can identify them all), organic sweet carrots, our hydroponic tomatoes, broccoli and cauliflower, and topped with Florida fresh avocados and our strawberries served with our very own poppyseed dressing and crumbled goat cheese. the next course will be an appetizer of toasted tilapia and homemade cheese grits. The main course will be served next of braised and glazed rib eye cutlets with roasted seasoned red potatoes and Brussels sprouts (prepared so you will actually eat them!). This course we serve with wine. You will end the evening with our famous strawberry dessert and coffee. You must register for the lunch in advance to ensure enough food is prepared for everyone to enjoy. This is one of the best dinner experiences you will ever have. You dine here at the farm and depending on the weather, time of year, and other things going on here at the farm, your dinning experience can be held inside the greenhouses, outside right on the farm or inside our building. Upon arrival you will be greeted with cocktiails and hor'devourses followed by a guided tour of the farm. After the tour you will be shown to your seats for a candle lite dinner of a 6 course meal which is all prepared from farm grown foods and by the farm ladies and sometimes by local chefs. First course is fresh made and baked breads served with assorted homemade fruit butters and infused oils for dipping. Second course is our own homemade potatoe soup with a piece of battered and deep fried bacon. Next comes our famous farm salad of all fresh hydroponically grown greens and tomatoes with our broccoli and cauliflower, sweet organic carrots topped with our Florida fresh avocados and our strawberries with our own poppyseed dressing and crumbled goat cheese. The next course is an appetizer of stuffed acorn squash served with a stuffed tulip tomatoe. Main course will then be served consisting of bacon wrapped tenderloin stuffed with sweet apricots with a bourbon apple glaze served with wild rice and white asparagus seasoned to perfection. Dessert will end the evening....and our dessert will be a trio of chocolate zucchini cake, our famous strawberry dessert and our very own homemade cheesecake topped with fresh berries. Wine is paired with each course, including dessert, but coffee is served after dessert. Cost $60/person or $100/couple. This includes lunch and snack. This day camp is a condensed version of all of the classes we have been holding. We are teaching you, so you can teach your kids. We will go through a lot of the things we do on the farm and self sustainability. 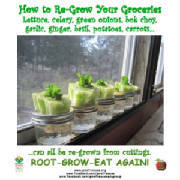 From gardening to chickens to bees to canning to making your own bath and body items and making your own food products. Dlee will be teaching....9-10 BackYard Chickens, 10-11 Canning & Freezing, 11:15-12 Self Sustainability, 12-12:30 Q & A. $30/person .....If you LOVE BACON....this is the Event for you!!! Bacon made any way you can imagine...and many ways you never even thought of. I wont spoil the surprise by telling you what all will be made or how it will all be prepared....I will just say it will be an interesting day...and one you wont soon forget!!! We are also adding salad to this days events...we wouldnt want anyone getting sick from an overload of bacon. All sorts of salads prepared all sorts of ways...and again..some ways you have never even thought of. Have you ever heard of "salad on a stick". Well your gona love it!! This Event is to feed the bacon lover in all of us. And once your full, we bring on desserts......more food and lots of fun!!!! This class covers the whys and how's of the 10 top and most important life skills we can have and need to teach our children. This Class is just as important as our Self Sustainability class. 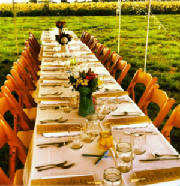 Kids Farm to Table Dinner.....this is a dinner like no other for kids. We also include the parents as they are requested to stay as well and for $20 more can have dinner as well. Parents will be seated and served in a different area from the Kids Dinner but will join their child for dessert. We also have times for peaks so you can see your child. Childrens menu.....assorted breads with homemade butters infused with fruits and dipping oils. Soup served next and will be our fresh potatoe with bacon. Salads follow and are a scaled down version of our adult dinner salads. Next will be an appetizer of breaded and pan fried flank steak stuffed with cream cheese and other farm cheeses served paired with fresh ground cheese grits. The main course will be homemade chicken Alfredo with homemade cheesy French bread. Parents will join their children for dessert and we will be serving our famous strawberry dessert. We will be adding some non alcoholic drinks at different times durning the evening for fun for the kids. Parents are invited to stay and enjoy an evening of their own. Parents dinner is $20 each and will consist of....assorted homemade breads, soup and salad with their main course consisting of breaded and pan fried flank stuffed steak topped with a mushroom Marsala sauce, with toasted and roasted seasoned and buttered red potatoes with steamed broccoli topped with garlic and parm. Hob Nob Get Together. 5-8. Cost is $40 per person. This is an enjoyable evening to get out with your friends (NO kids allowed - NO one under 21!). We will have all sorts of foods to eat all night, and we will have an open bar and be making all sorts of drinks. Enjoy an evening out with some great fresh farm foods! Taste of the Farm Annual Farm Fundraiser Dinner Event. 6pm until. This is an event. We will have 6 local chefs competing to win prizes. This is also a farm fundraiser, so there are no discounts. Cost is $115 per person. Prizes will be drawn for guest throughout dinner. We will also have a silent auction, which will be set up to bid on upon arrival. Simon Majumdar from Food Network will also be at this event! See our homepage for more details!